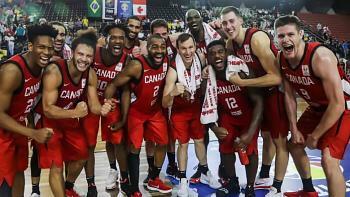 Canada's men's basketball team has clinched its first spot in the FIBA World Cup in almost a decade. The win improved Canada's record to 8-2 with just two games remaining in the second round of qualifying, guaranteeing the team a top-three finish in its group. "It's been a long time since this country has had a chance to be back on the world stage," said veteran centre Joel Anthony. "I remember when we qualified the last time and just a really proud feeling to be able to be back and see us get back there. "To be able to be a part of it is extremely special to me. I'm just really happy, grateful, thankful and excited that we're able to be back where we belong." The Canadians didn't have the use of any of their NBA players for this round of qualifying, and the majority of players had come half way around the world from various squads in Europe. Canada's thrilling win also came after a gruelling travel schedule. Flight delays turned what should have been a nine-hour trip from Orlando to Caracas, Venezuela into a 25-hour trek. Canada lost to Venezuela 84-76 hours after landing. The Canadians' second leg to Sao Paolo took 18 hours. "It feels amazing to travel all this way and accomplish our goal," said Wiltjer. FIBA changed its World Cup qualifying procedure to fall more in line with soccer. But the difference soccer has "international dates" where the top leagues suspend play to allow their world's best players to join their countries in qualifying. So, assembling rosters has been a tough task for Canada's basketball coaches. They've used 35 players so far. The United States, with 36, is the only team in the Americas that has used more. "A great and historic win for our country," said coach Roy Rana. "Character wins and I could not be more proud of all the guys who helped us through the windows to date as we now advance to the FIBA Basketball World Cup 2019 in China." Canada will play its final two contests at Mile One Centre in St. John's, N.L., on Feb. 21 versus Chile and Feb. 24 against Venezuela. Canada hasn't appeared at the World Cup since the 2010 tournament in Turkey, where they went 0-5 to finish 22nd of 24 teams.